The present church building dates from the end of the thirteenth century. Monuments both inside and outside the church commemorate the Clevland family, who once lived at Tapeley Manor and the Christie family, to whom the house and estate passed by marriage. There are also monuments to the Berry Torrs, who lived in the littler village of Eastleigh. Some restoration work has been done, and more is envisaged in the near future when funds become available. The present congregation is small and ‘elderly, though there is a much bigger body of people who come on special occasions and are willing to help in practical ways. The church and the pub are the two main focal points for this community. 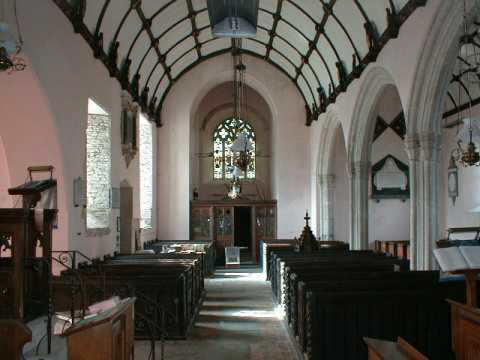 St. Peters, Westleigh is part of the United Benefice comprising St. Peters, Westleigh, St. Johns, Instow and St. Peters Fremington. 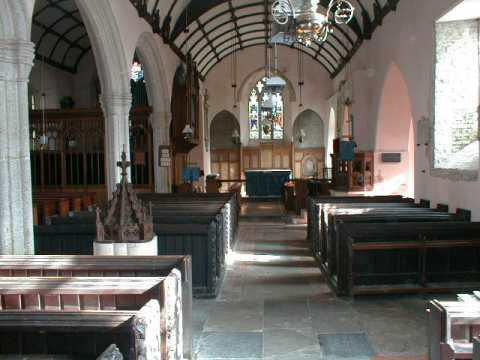 Reverend Keith Brimacombe is the vicar of St. Peters, Westleigh and St.Johns, Instow. At such times, it is good to remember that the Church is not primarily a building or an ordained minister, but rather the people of God. People have worshipped here for hundreds of years and they do so still. Please pray that others in this generation will come to put their trust in Jesus Christ as Saviour, and bear witness for him in this rural community. The most solemn week of the Christian year, Holy Week is the week leading up to Easter, and is the time when the last week of Jesus's life is remembered in the church. Holy Week begins on Palm Sunday. This is always the Sunday before Eater Day when Christ's triumphant arrival in Jerusalem to the cheers of the crowd is commemorated. In many churches large palm branches are carried in processions and people hold small crosses made of palm leaf, to remember the palm leaves which the people of Jerusalem waved when Jesus arrived, and to remember the cross on which he died. Maundy Thursday is the Thursday before Easter. Christians remember it as the day of the Last Supper, when Jesus washed the feet of his disciples and established the ceremony known as the Eucharist. The night of Maundy Thursday is when Jesus was betrayed by Judas in the Garden of Gethsemane. The word maundy comes from the command (mandate) given by Christ at the Last Supper, that we should love one another. The most important events in Christianity are the birth, death and later resurrection of Jesus Christ, who Christians believe is the Son of God, and whose life and teachings are the foundation of Christianity. Good Friday is the Friday before Easter. It commemorates the Passion: the execution of Jesus by crucifixion. It is a day of mourning in church. During special services Christians meditate on Jesus' suffering and death on the cross, and what this means for their faith. Holy Saturday is the Saturday after Good Friday. The Easter vigil service is the first Easter service, and takes place on this night. The idea is for the faithful to wait and watch, hopeful and confident that Christ will return. The Easter, or Paschal, candle is lit during this service. This is now a symbol of Christ - risen as the light of the world, and come into the midst of the people. Easter Sunday is the culmination of Holy Week. It is the most important Christian festival commemorating the resurrection of Jesus, and the one celebrated with the greatest joy. Churches are filled with flowers, and there are special hymns and songs. Jesus Christ was executed by crucifixion. His body removed from the cross, and buried in a cave. The tomb was guarded and an enormous stone was put over the entrance, so that no-one could steal the body. But on the following Sunday, some women visited the grave and found that the stone had been moved, and that the tomb was empty. Jesus himself was seen that day, and for days afterwards by many people. His followers realised that God had raised Jesus from the dead. What will make our heart skip a beat this Easter? A Thanksgiving Service was held on 21st February for the life of the late Captain Paul Fronteras, Master Mariner, Trinity House Younger Brother, attended by 75 friends and family. The address was given by Christian Fronteras. A retiring collection was taken for the RNLI and Macmillan Nurses. The Trinity House flag was flown from the church tower in tribute to Paul. There will be a service of holy communion on Easter Sunday 21st April at 9.30am to which all are warmly invited. The Annual Parochial Church Meeting will be held on Friday 26th April at 6pm in church. The meeting will review the past year and elect the churchwarden, PCC members and Deanery Synod representative. This year a new Church Electoral Role is being produced. Application forms for enrolment have been issued. Anyone whose name is on the Role is entitled to attend the meeting and take part in the proceedings. Further details are given in the notices in the church porch. Advance date for your diary:- There will be a soup and dessert lunch on Friday 10th of May from 12.00 to 2.00pm in the village hall in aid of church funds. All are welcome. Lost property: A pair of men's gloves have been left in the church. Please contact the churchwarden or secretary to claim them.